Mark the growth of your little human with Jolie Bouchard's personalized banner featuring curious creatures. You're how tall now? That's wild! Mark the growth of the little (for now) human in your house with Jolie Bouchard's banner, personalized with your child's name. Record their upward journey (up to 62 inches) with a permanent marker on the museum-quality canvas banner while a fox, deer, raccoon, giraffe, and friends peek in to check on their progress. Hang this sweet scene in minutes with its stylish ribbon and top and bottom dowels to keep things smooth. It's a natural for any bedroom or playroom decor. Made in Oregon. After 15 years in the high paced tech industry on the West Coast, Jolie Bouchard turned her lifelong passion for design into a business. "One of the most exciting things is that my daughters get to see their mom running a business I’m passionate about. I want them to find that for themselves," reflects the mother of two. Jolie was inspired to create modern and meaningful kids art after designing custom pieces for her own daughter's room. Her six-year-old daughter has developed quite the artist's eye and enjoys "working"next to mom, suggesting just the right final touches. 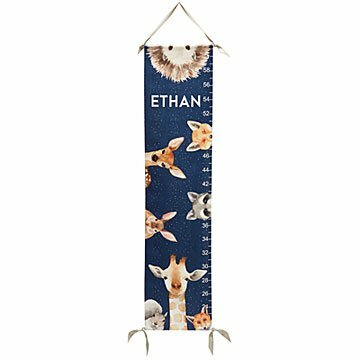 42" L x 10" W; measures heights up to 5'2"
Growth chart to hang. Can be moved from place to place. Appropriate for younger children, very appealing painted appearance. Substantial canvas material, quality artistic work. So Cute - Added to the "Go To Gift List"
This was so cute that I bought this for our own home. We love it so much that this is now on my go to gift list! It is very high quality and really looks great in his room. He loves the animals and wants to measure himself all the time. Total win! What a wonderful growth chart! It's so colorful with those animals, that my granddaughter just loved it. My daughter and son-in-law flipped over it, which made my so happy.